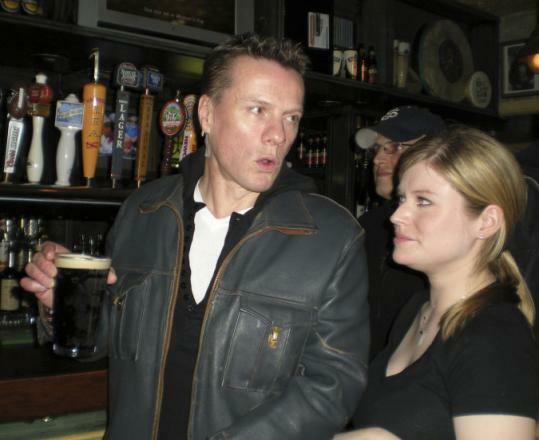 From left: Larry Mullen Jr. and Courtney Taylor of Tommy Doyle's; Mary-Catherine Deibel, Deborah Hughes, Bono. U2 caused a bit of a stir in Cambridge Wednesday night after their not-so-secret, five-song show at the Somerville Theatre. The lads arrived in a fleet of black SUVs and were promptly escorted into the restaurant through an underground garage and back hallways. (Bono paused in the kitchen to give one of the workers a big kiss.) Deibel said she and her partner planned the party for a week but were sworn to secrecy, not allowed to tell even the staff. Why UpStairs on the Square? Seems the Edge is partial to the place, having been in a few times for lunch with his pal Dr. William Li of the Angiogenesis Foundation. The crowd of 60 or so people included mostly radio execs and programmers, as well as MTV types like Sway and Dave Sirulnick. Dustin "Fletcher" Matthews, assistant program director at WFNX, said he's not often impressed by rock stars, but he's a huge U2 fan. (He has the image of a Joshua tree tattooed on his arm to prove it.) "I didn't have any super nerdy questions," said Fletcher, cohost of the morning show "The Sandbox." "I just asked Bono for a hug, and it was a good one. Not a handshake hug, but a full-on hug." We're sure the dim lights, votive candles, and roaring fireplace only enhanced the vibe. Chefs Steven Brand and Susan Regis fixed margaritas for the band - that's their drink of choice, apparently - and tempura shrimp and Susie's special creamed spinach and chanterelle pizza. "It was daunting to keep it all under wraps," Deibel told us yesterday. "It was clear to people that something was happening because there were cop cars out front, but we just said it was the Rabinowitz bar mitzvah." If Mullen made it inside, our sources didn't see him. But the handsome drummer did show up at Tommy Doyle's, the Irish bar across the street. Said GM Garrett Tingle: "He ordered a Guinness and a few drinks for his friends. Everyone's jaws dropped to the floor, but he was very gracious with customers and stayed for about 45 minutes." One of those customers was actor and "On Broadway" producer Lance Greene. "I told him the band was a big influence on my life, not that it'd helped that much," Greene joked. U2 will be back in town Sept. 20 to play Gillette Stadium, and don't be surprised if they add another show or two. "Mad Fisherman" Charlie Moore's got nothing on Randy Moss. The Pats wideout (above) landed an 8-pound bass during a recent fishing trip in Texas with his friend, Steelers safety Tyrone Carter. The footballers were on the water with professional angler Mike Kernan, who told us he was mighty impressed with Moss. "He's a pretty dang good caster," Kernan said. Boston Ballet artistic director Mikko Nissinen can finally take off one of his hats. The company has hired a new executive director, Barry C. Hughson (left), who holds the same position at the Atlanta Ballet. Nissinen has performed both jobs since Valerie Wilder left for the Australian Ballet last March, said spokeswoman Mariel MacNaughton. Hughson, who will take over June 1, is a Connecticut native and former dancer with the Washington (D.C.) Ballet; he's also worked in administration with the American Repertory Ballet and Princeton Ballet School. "He has a strong and impressive background and brings a range of experience, including work on both the artistic and administrative sides," Nissinen said in a press release. "As a former dancer, Barry brings a holistic perspective to Boston." The city of New York is looking for someone to take over the venerable Central Park eatery known as Tavern on the Green, and Seth Greenberg says he's interested. The BU grad who developed the Paradise, Mistral, and XV Beacon, among other Boston properties, tells the New York Observer he'll be responding to the city's request for proposals. "We happen to have plenty of interest in that. It is precious, and it's a New York landmark, and it deserves to be done right," said Greenberg. New York's parks department is looking for restaurateurs interested in operating the lucrative 25,000-square-foot eatery. Others mentioned as possible bidders include Danny Meyer, Drew Nieporent, Dean Poll, and Donald Trump. The Huntington Theatre threw a power-player bash Wednesday night for the opening of playwright Richard Goodwin's "Two Men of Florence." In the crowd to celebrate the former JFK and Lyndon B. Johnson speechwriter: lead producer Stephen Pagliuca, Bank of America bigwig Anne Finucane and her husband, broadcaster Mike Barnicle, architect Jeremiah Eck, Farm Aid director Carolyn Mugar, former Poet Laureate Robert Pinsky, Obama adviser Samantha Power, law guru Larry Tribe, business moguls Jack and Suzy Welch, producer Fred Zollo, premier Sox wife Stacey Lucchino, and former Austrian ambassador Swanee Hunt. Goodwin, by the way, was called on stage for a curtain call with actors Edward Herrmann and Jay O. Sanders. And at the after-party, he and his wife, presidential historian Doris Kearns Goodwin, received a very creative toast from play director Edward Hall and his wife, comedian Issy van Randwyck. A few lines from Hall's poem: "This is no Team of Rivals, for together they stick. Like Adam to Eve and Ben to Jerry, like M to M or peanut butter to jelly." We're told it was a hit. We're told John Wells is in town to cast and also scout locations for "The Company Men." The drama stars Ben Affleck as a guy whose life is turned upside down after he's laid off. (Is that a timely tale or what?) It's the directorial debut for Wells, who's made his name as a writer and producer of "ER" and "The West Wing." (He's also written the screenplay.) Word is filming will start in April. Names can be reached at names@globe.com or at 617-929-8253.